A thousand years in the future, Kitai (Jaden Smith) and his father, Cypher (Will Smith), are the only survivors when their spaceship crash lands on uninhabited Earth. Cypher is left unable to walk, and so he must use remote technology to guide Kitai on his journey to find the distress beacon that can save their lives. Once communications are cut off, Kitai must make his way alone through dangerous territory. Throughout their ordeal, both father and son are strengthened by warm family memories of mother Faia (Sophie Okonedo) and sister Senshi (Zoe Kravitz). Even though physically absent, their strong bonds clearly help keep Kitai going until he's finally able to face his fears and defeat the alien monster tracking him along the way. 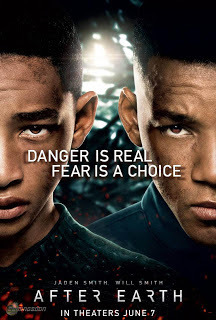 AFTER EARTH presents a future with a lot of cool technology and eye candy, and director M. Night Shyamalan deftly weaves excellent special effects action and excitement with the development of the father-son relationship. As Cypher, Will Smith convincingly portrays the stern, strict military man, often away from home on long tours of duty and unable to show much emotion to others. Jaden Smith, as Katai, has a few weak points in his performance (why was he asked to use that accent in the first place? ), but he capably carries the bulk of the action. Predictably, the father and son are ultimately able to bond and demonstrate their emotions to one another, but watching them get there in front of the sci-fi action backdrop sure is a lot of fun. There's a lot to admire here, especially the strong family bonds and positive role modeling of all the main characters, even though the Will Smith formula feels familiar. The heartbreaking deaths of some animals and the super-scary alien monster add emotional depth and thrills, but the action is punctuated with genuine laughs and family warmth, which takes the edge off. Overall, this is a solid sci-fi action movie with strong positive messages about family that teens and possibly older tweens can enjoy with their parents.